Do you log your trips? Use your car for business? Deduct costs on your taxes? Do you drive your car for business? mileME automatically logs all your trips. No buttons to push. That means you can get the full benefit of your tax deduction or expense reimbursement for every business mile you drive. Sign up now and get the first 30 days for free. After that, the service costs $5.99/month or $59.99/year. This gets you unlimited reports and all your trips will be stored in the cloud for 4 years, in case you need the data. Download the mileME app for your iPhone. mileME will ask you to create a mileME account to sync your trips from your phone to the cloud. 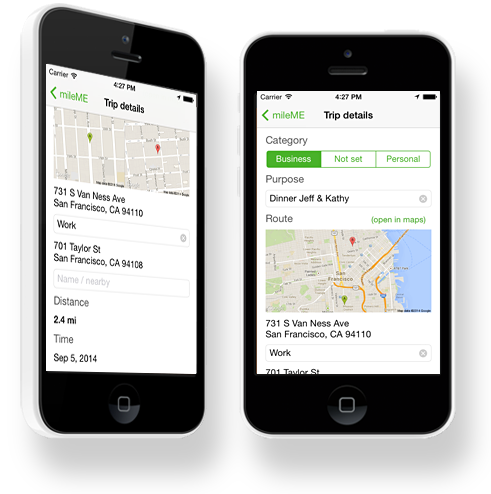 mileME automatically logs your trips for you. You don't have to push a button to start or stop tracking your miles. 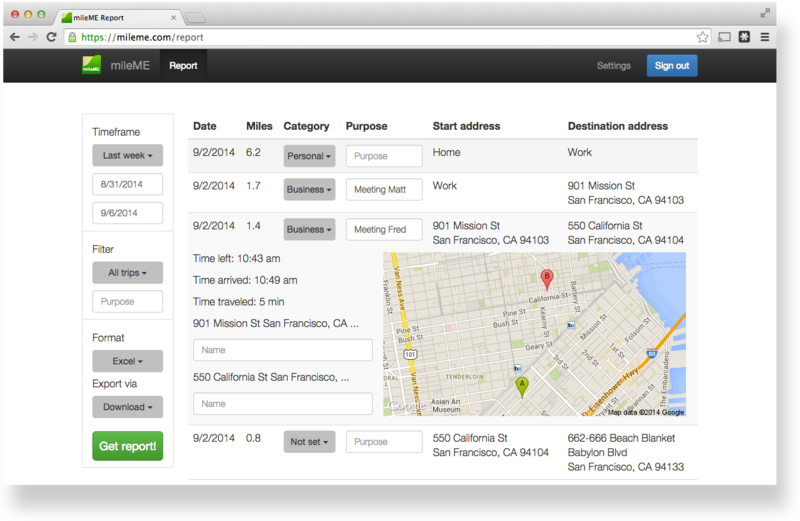 mileME automatically logs your trips for you. You can categorize your trips in the app or on mileME.com whenever you want. When an entry in your calendar matches with a trip, the purpose for the trip is set automatically. You can also name locations and mileME will learn from your input and automatically name and categorize trips correctly the next time. Just tap the Get report button in the app or sign in on mileME.com to generate a report. It's as easy as that! How many months are you behind on your expense reports? 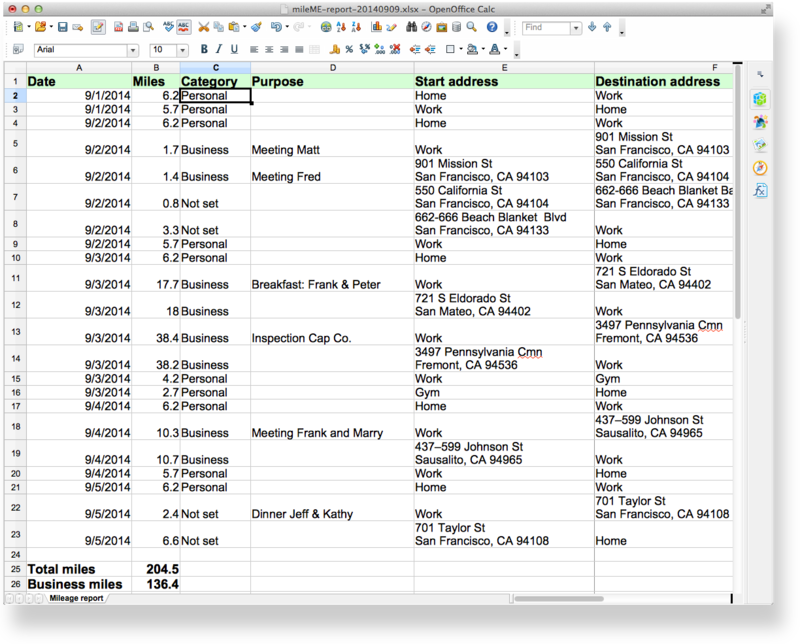 How many business miles are you missing because you have no documentation? mileME makes the process of logging your miles so simple you can get the benefit of the full tax deduction or reimbursement. At the current IRS mileage rate of 56 cents per business mile driven that adds up to a lot of dollars in your pocket. If you drive 12,000 miles a year for business, that means over $6,500 in reimbursements or tax deductions. After only 110 miles mileME already pays for itself.